A new investment in state-of-the-art facilities and a new commitment to fitness on the Reebok campus has the work force up and running and the company pushing new product development from a hands-on perspective. The approach to physical activity and sports was once pretty easy-going and unfocused at Reebok’s 66-acre campus at the base of the Blue Hills southwest of Boston. But five years ago that started to change. It changed with a mindset shift toward specific fitness—CrossFit, Spartan Races, and other group activities—and it came with a facility upgrade. Realizing that physical exercise helps to stimulate cognitive abilities, five years ago Reebok dedicated an hour of every day for the 1,000 on-campus employees to get moving—anything from walking to a hard CrossFit WOD to a run into the Blue Hills. This philosophy required facilities to match. trainers, Reebok retooled its philosophy both in fitness and in product around this new on-campus destination. They didn’t stop there. 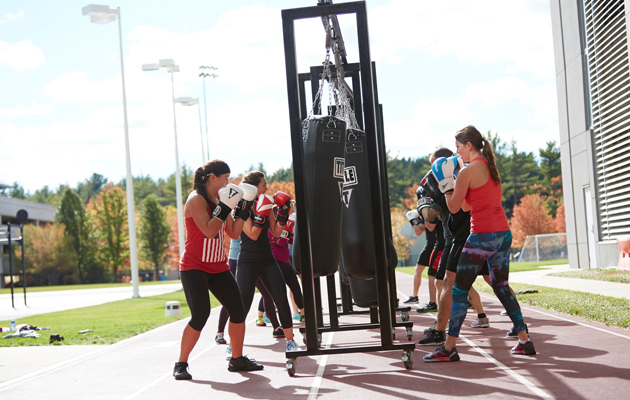 Along with the basketball court, 400-meter track and much more already in place, Reebok has since added a boxing/kickboxing/martial arts facility to meet demand. They bought mountain bikes for employees to use in the hills, created running clubs and brought in high-level trainers for a variety of fitness activities. Here’s a run-down of the sweat-inducing stops available: a 37,000-square-foot, three-floor fitness center with a basketball court (can also be used for volleyball or badminton), a 34-bike cycle studio, a group exercise studio, free weights, a cardio area, training areas with battle ropes and more, locker rooms with towel services, a soccer pitch, tennis courts, a softball and baseball field, therapy areas and a Spartan Race obstacle course. The Spartan Race obstacle course provides a good example of that. Not a common activity for the average gym, this sprint course takes about 30 minutes for someone to complete, usually serving as an add-on to other activities. O’Toole says that with such variety on campus, the employees have a desire to move beyond the campus, putting together teams to compete in everything from Spartan races to Ragnar Relay (overnight races) teams.